After watching her husband transported under guard across the bay to Alcatraz Brenda decides to stay in San Francisco and wait for his release. She looks for a place with a view of the prison and comes across a promising ad. ... and Now, this is 301 Lombard Street in Telegraph Hill where Telegraph Hill Boulevard begins winding its way up to the parking lot at the base of Coit Tower (map). The house is still there today, hardly changed. ... in 1950 ... 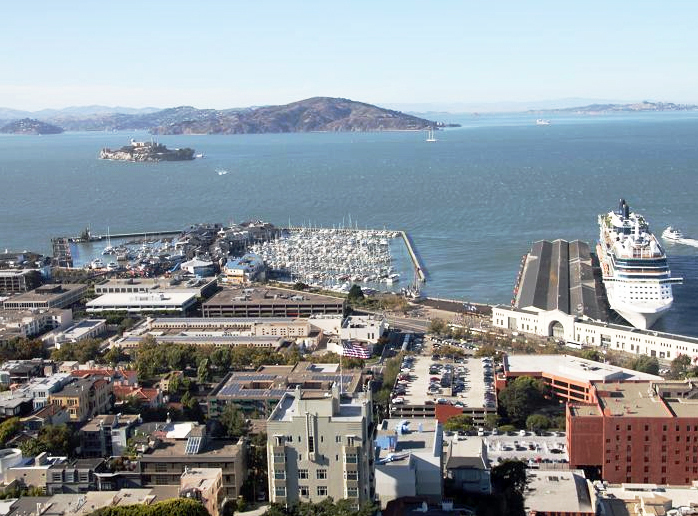 The movie Woman On The Run includes a scene filmed in 1950 at the circular perimeter of the Coit Tower parking lot which shows the same Yerba Buena Island view. The image used for the apartment scene above was taken at this location to capitalize on the higher elevation. ... and Now, Why show this view from the other movie? Because, from the same spot now Yerba Buena Island and the surrounding panorama is completely hidden by tree growth. City management doesn't seem to realize that an occasional arboreal haircut is all that's needed to completely restore the surrounding breathtaking vistas for the benefit of the 200,000 folks who visit here each year. Then ... The next room looks out to the north and Brenda is stopped in her tracks by the sight of Alcatraz ... this is the place for her! For this studio view projected background footage filmed at the Coit Tower parking lot was used. At far left is part of Belvedere island and the two piers down on the Embarcadero are Pier 41 at bottom left and next to it Pier 39 as it was long before being replaced by today's tourist complex. ... and Now, here's a recent matching shot of that same view from the Coit Tower parking lot just visible, for now anyway, above the trees (but only if you stand tippy-toes on the perimeter wall). Absent those trees both piers, since demolished and rebuilt, would also be visible from here. ... from a vintage photo ... This 1952 photo taken from the top of Coit Tower (210 feet higher than the parking lot) shows, from left to right, piers 41, 39, 37 and 35. It happens to capture Brenda's window view in the top left quadrant and also 'The House Across The Bay' itself at 301 Lombard Street (arrowed at bottom left). Clearly the views from the actual house would be far less impressive and the house opposite, built in the 1920s, would block its view of the piers anyway. ... and Now, the same view today reveals changes on the waterfront. Pier 41 at far left is smaller than it was, rebuilt as a ferry terminal. Pier 39 has been developed into a tourist sprawl and Pier 37 disappeared to make way for the Pier 39 marina. Only pier 35 remains as it was. 'The House' too is still there but out of sight just below the bottom of the frame - most of the houses around it are also there today.